French Polynesia is the essence of true romance. What other tropical destination is more romantic than "Tahiti?" 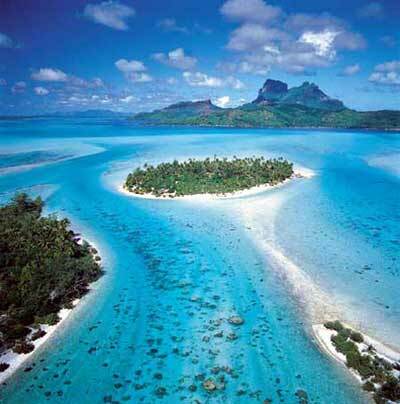 We have all said, "Someday I will visit Tahiti." Among these idyllic islands of soaring volcanic peaks and low island atolls, each new day is more perfect than the last. Imagine the crystal clear reef protected lagoons with fairytale colors of jade green and luminous turquoise, so gorgeous that you will want to pinch yourself to see if you are dreaming. The islands are surrounded by sandy islets called motus which invite a castaway picnic or a romantic interlude. Polynesians are genuinely warm, hospitable and so very proud of their islands. Everywhere you turn you will see the islanders greeting you with a warm Ia Orana and a warm smile. From your flower lei greeting upon arrival in Tahiti to the songs performed by cheerful Tahitians, you will know that these lovely people are truly happy that you have come at last to visit the legendary islands of French Polynesia. The awe-inspiring beauty of each island is certain to remain etched forever in your memory.